If there is one thing my mother loves, it's a good bakery. With all the sensational sights and smells to take in, she pretty much just stands in the center of a store and starts spinning as if she were Mary Tyler Moore throwing her hat up into the air with glee. Yes, she gets that excited. This excitement was taken to a whole new level when my aunt suggested that we pay a visit to Wright's Dairy Farm and Bakery, which is about 13 minutes down the road from Wright's Farm Restaurant. She raved about their fantastic pastries, so of course, this was something that Mom and I couldn't miss - but we missed it. Twice. It turns out that the tiny arrow pointing down toward the farm at the corner of Route 102 and Woonsocket Hill Road didn't catch our eyes. Perhaps we were overwhelmed with thoughts of pastry or stuffed from all the chicken we just ate. Nonetheless, we eventually spotted the arrow and drove down the winding street to the farm at around 5:30 p.m. This farm was exactly what all farms should look like. There were large dairy cows roaming the fields, bales of hay stacked up in one of the barns, a milking station, various storage sheds, farm equipment, and oh, did I mention the huge gourmet bakery? We drove past a sea of large boxes with tiny calves inside (perhaps for protection from the larger cows) and into the bakery parking lot. The lot wasn't too big, but was practically full. People love this place! When we stepped inside through the sliding doors, Mom's jaw dropped. I thought she was going to spin, but she just stood there in awe of all the mouth-watering delights that were scattered throughout the beautiful country store. Right away we spotted a shelf with Wright's Dairy Farm T-shirts. I should have gotten one! We didn't know where to look first, so we slowly made our way through the well-stocked shelves filled with cakes, cookies, pies, breakfast goodies, and other treats. Individual cream pastries include the small cream puffs, chocolate and strawberry boats (large and small), peaks, apple crisp, raspberry bismarks, comets, and assorted cake squares. Individual custard pastries include large and small éclairs, maple and vanilla napoleons, trifles, and zeppoles (seasonal). 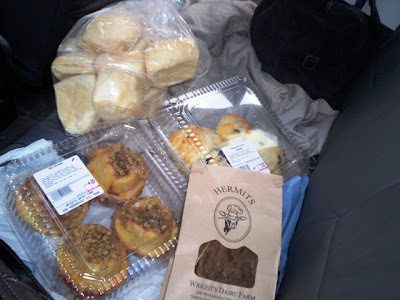 Other refrigerated goodies include rum teacake, cannollis, and apple dumplings (seasonal). Some of the many flavors of pie include chocolate, coconut, banana, apple cream, apple, pumpkin (10" only - seasonal), key lime pie (9" only), custard (10" only), and pecan pie (10" only - seasonal). There are also fruit square, cookies (such as chocolate chip, hermits, oatmeal raisin, peanut butter chip, Russian tea cookies, butter/shortbread, M&M, macaroons, Florentine, vanilla bisquits, pin wheels, and sugar), bars (brownies, M&M brownie, Mounds, radio, magic, and pecan diamonds), and their many varieties of cakes, such as strawberry shortcake, black forest, cow, three-layer, checkerboard, fresh fruit tiara (seasonal), killer (8”), cheesecake (10” plain or fruit), carrot, zuppa (8”), and tiramisu (8”). Other baked goods include muffins and scones, flaky pastries, bow ties, rogarts, angel wings (cinnamon discs), bear claws, eccles cakes (pretzels), almond crescents (pie pockets), baklava/choco-almond treasures, sugar-free pie pockets, sweet rolls and buns, danish, meltaways, pecan rolls, coffee rolls, and hot cross buns (seasonal). Everything was reasonably priced, fresh, and looked out of this world. We also noticed the large refrigerated case at the end of the store. Wright's really prides themselves on their fresh milk products. According to their Web site, the milk never leaves the store and comes straight from their cows to our tables in less than 48 hours. Milk products include skim, 2%, whole, chocolate, and coffee milks. They also have mini milk containers for the kids. Wright's also carries both light and heavy cream, and egg nog (available only in November and December). Although Mom and I weren't interested in buying milk at that time, we were both dying to know how it tasted. Later on, we had a fan of ours tell us that all their milks, no matter what percent it is, have the flavor of whole. Sounds good, but we were more interested in the refrigerated pastry case. After taking a number (just like at the deli), a young worker asked us if we were ready to choose something. I had narrowed my choices down to two things. 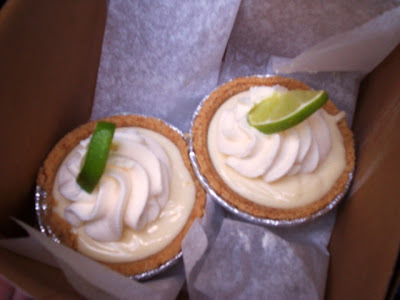 One looked like a key lime tart, and the other looked like a smaller key lime tart. Since one was large and green and the other small and white, yet they were both topped with limes, I asked the girl behind the counter to describe them. She told me that the white tart was called a key west, and had a more tart flavor than the key lime. Since it looked delicious - and easy to hold in the car - I decided to get one of those. Not wanting to be left out, Mom got one as well. The worker placed the tarts in a small box, printed out a receipt, taped it to the top of the box, and sent us on our way. Before we left the bakery, Mom spotted some spoons in a jar by the register. We had both wondered how we were going to eat the tarts in the car, but thankfully Wright's provides both spoons and straws for your eating and drinking pleasure. When we got to the car, we took the two tarts out of the box and grabbed the spoons. We rolled down the window, hoping to smell some fresh country air, but all we could smell was cow manure. Rolling the windows back up, we dug into our cool, fresh key wests. The key west lived up to its name. It was a bit more tart than the key lime, but absolutely delicious. The real cream that was on top really helped cut the tartness so there was a nice blend of flavors with every bite. 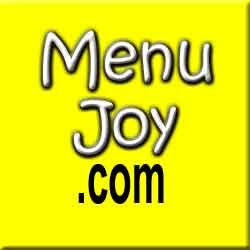 The crust was flaky, the filling cool and creamy, and it was really a delight to eat. Of course, Mom saw about 100 other things she wanted to buy, but I had to stop her. After all, how many baked goods can one family have? Wait ... maybe I shouldn't ask that question. Before leaving the farm, which has been servicing the Rhode Island community for over 100 years, we decided to take another spin around the parking lot to get a better look at the cows. A personal shout out goes to cow number 80, who posed for a picture for me!! Make sure you check out our slide show to see him, or her, in all his bovine glory. Both Mom and I adore quaint little out-of-the-way places like Wright's Dairy Farm and Bakery. It is the perfect place to visit on a beautiful spring afternoon, and there's nothing better than freshly made pastries from a picturesque New England farm - no matter what season it is. Wright's Dairy Farm and Bakery is open from 8 a.m. to 7 p.m. Monday through Saturday, and 8 a.m. to 4 p.m. on Sunday.